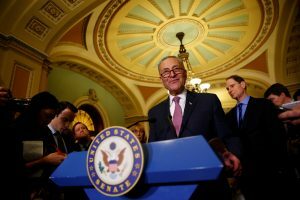 WASHINGTON — The top Senate Democrat said Thursday he will oppose President Donald Trump’s Supreme Court nominee and lead a filibuster of the choice, setting up a politically charged showdown with Republicans with far-reaching implications for future judicial nominees. New York Sen. Chuck Schumer criticized Judge Neil Gorsuch, saying he “almost instinctively favors the powerful over the weak” and would not serve as a check on Trump or be a mainstream justice. Shortly before Schumer’s announcement, Pennsylvania Sen. Bob Casey, who faces re-election next year in a state Trump won, also announced his opposition. Casey said he had “serious concerns about Judge Gorsuch’s rigid and restrictive judicial philosophy, manifest in a number of opinions he has written on the 10th Circuit.” Sen. Bernie Sanders, I-Vt., also announced he would oppose Gorsuch. Democrats are still furious that Republicans blocked former President Barack Obama’s nominee, Merrick Garland, and the seat on the high court has remained vacant for 13 months and counting. The GOP insisted that the next president make the nomination. “Gorsuch will be confirmed; I just can’t tell you exactly how that will happen, yet,” McConnell said in an interview with The Associated Press earlier this week. White House spokesman Sean Spicer called Schumer’s announcement disappointing and said it breaks with the tradition of how the Senate has handled Supreme Court confirmation votes in modern times. Hearings for a Supreme Court nominee usually dominate Congress, but that’s not been the case over the four days of hearings. The Republican push to dismantle Obama’s Affordable Care Act and the controversy surrounding the investigation into contact between Trump associates and Russia overshadowed the hearings. On Thursday, lawyers, advocacy groups and former colleagues got their say on Gorsuch. Critics said he tended to rule for powerful interests and against workers, the disabled and environmental groups, but those who worked with him over the years sought to assure senators that he goes into each case committed to hearing and evaluating all points of view before making up his mind. The American Bar Association’s Nancy Scott Degan explained how a committee evaluating Gorsuch came up with its highest rating of well qualified. She said the committee contacted almost 5,000 people nationwide who might have knowledge of his qualifications. They examined his qualifications based on integrity, professional competence and temperament. Sen. Dianne Feinstein, D-Calif., also noted that Garland received the ABA’s well-qualified rating, but didn’t get a hearing. Republican Sen. Orrin Hatch of Utah said he agreed that Garland is a wonderful person and well qualified. Retired U.S. Court of Appeals Judge Deanell Reece Tacha served with Gorsuch and told senators he brings to the bench a powerful intellect and does not use his role as judge for anything other than deciding the case before him. Some witnesses who were critical of Gorsuch worried that he would not be a strong check on executive overreach. Elisa Massimino, president and CEO of Human Rights First, described him as someone “who wouldn’t stand up against a presidential power grab,” stemming from his service in the Justice Department during the Bush administration. And a Colorado man criticized Gorsuch for ruling against his autistic son in a case, saying Gorsuch’s opinion eviscerated the minimal education requirements schools must provide disabled children. Left: U.S. Senate Minority Leader Chuck Schumer (D-NY) speaks during a news conference Mar. 7 on Capitol Hill in Washington, D.C. Photo by REUTERS/Eric Thayer.